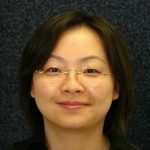 Dr. Chen focused her research on explaining how stem cells continually self-renew or how adult stem cells can sustain tissue regeneration throughout a lifetime, healing wounds and replenishing old cells. During her fellowship, she studied this process using hair follicles and discovered that the first progeny or “offspring” of the initial hair follicle stem cells have already lost the stem cell identity and therefore, have lost their self-renewal ability. She is continuing to study self-renewal, as well as the determination of stem cell fate in her current independent role. She completed her postdoctoral studies at The Rockefeller University in Dr. Elaine Fuchs’ lab.